There are many different ways to hang a nest box. Your individual circumstances will determine the best way for you to hang it. Here are some tips and guides on hanging your nest boxes. 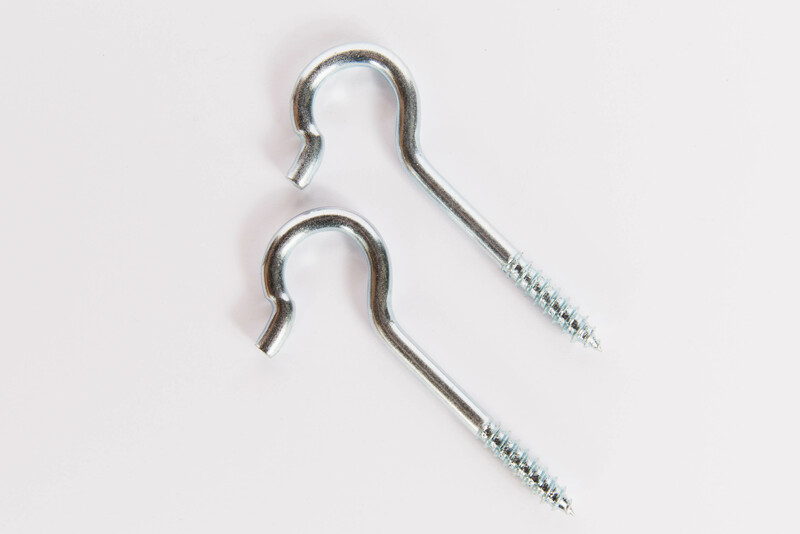 These tips should be useful for most, but may not work in every case..
We recommend using a pair of #8 mounting hooks which can be purchased and added to your order. The placement of the hooks is determined by the style of the nest box. For boot boxes, place a hook in the top corner opposite the toe of the boot. Place the second hook at the top of the toe area. DO NOT place both hooks at the top of the box, or you will end up with one of the hooks acting as a pivot point, and the box will rock back and forth when the bird walks along the floor of the nest box. Next, place the hooks in the area of the two small black circles. ***** Please note that there will not be any black circles on your actual nest box. They are on the photo for illustration purposes only. ***** Make sure that the hooks go through the front of the nest box and into the side piece of wood for proper support. You may also move the hook location lower on the box in order to match up the hook with the cage wires. This is acceptable, and an example of this is below. As long as you keep the two hooks somewhere in the black area outlined below, you should be okay. After that, just hang the nest box on the cage. The weight of the box will keep it in place. Do not worry if there is a small space between the nest box and the cage. It should be too small to be of any consequence. Just attach the hooks to the top corners on each side. This would apply to apartment nest boxes, grandfather nest boxes, quaker nest boxes, and cockatoo nest boxes. ***** Please note that there will not be any black circles on your actual nest box. They are on the photo for illustration purposes only. ***** Make sure that the hooks go through the front of the nest box and into the side piece of wood for proper support. After that hang the nest box on the cage. The weight of the box will keep it in place. We do not worry if there is a small space between the nest box and the cage. It should be too small to be of any consequence. Treat these like rectangular nest boxes. Just put a hook in the top corner on each side. ***** Please note that there will not be any black circles on your actual nest box. They are on the photo for illustration purposes only. ***** Make sure that the hooks go through the front of the nest box and into the side piece of wood for proper support. After that just hang the nest box on the cage. The weight of the box will keep it in place. We do not worry if there is a small space between the nest box and the cage. It should be too small to be of any consequence.